A Family Run Business Under The Same Ownership For Over 30 Years! Drive Tires 10" x 5"
Questions on the BCS 732HE Tiller? BCS tractors are all gear driven, have ball bearings supporting all transmission and wheel shafts, have a heavy duty cone clutch and a low center of gravity. These machines are designed and built the way an industrial machinist would design and build one for his or her own use. The superior design and construction of BCS machines cost no more than machines intended for the same uses but that actually are designed and built for only occasional use. BCS gives you agricultural equipment with superior performance and construction rather than home owner equipment with compromised performance and construction. In Europe many farms are small in size and intensively cultivated by walk behind two-wheel tractors that perform many tasks. This is where the BCS Gardening Equipment was developed and is where the equipment we sell is manufactured. 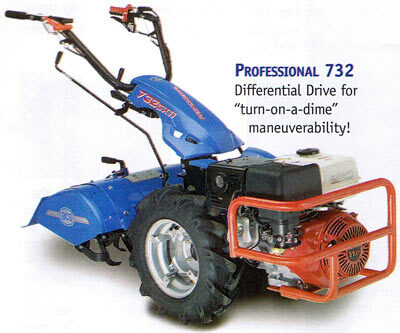 The BCS two-wheeled tractors with attachments perform a variety of tasks. The BCS Equipment System is capable of performing all these tasks. BCS performs these tasks very capably because the equipment is designed for agriculture use, not for the occasional use by one who needs the equipment only a couple of hours a year. Likewise the equipment is more durable and long lasting than the less rugged equipment produced for the occasional user by US manufacturers. that you can find. This means strong, healthy plants. Belts rob engine power and a short life; that is why BCS uses an automotive style clutch. Our clutch delivers more power to the tiller and last long, long time. Once you are done using the "Best Tiller On Earth," you can then turn your BCS tractor into a number of different machines by using a selection of our front attachments. The BCS tractor is designed to provide ideal forward speeds for your gardening needs. With three forward speeds you can get any job done at just the right speed. so you can engage reverse quickly and still keep both hands on the handlebars. BCS uses a Ring and Pinion in our Tiller Gearbox. This is stronger than the worm gear or chain case that the competition uses. You can put your BCS Tiller through very tough conditions without fear of breakage. BCS offers a 26" tiller box that when needed, can be reduced to a 20" tiller. This allows you to have a large 26" tiller that can be narrowed to get between the rows. It is like getting two tillers in one. New Haven Power Equipment reserves the right to make changes in pricing and specifications without notice. check on current availability. Prices are Based on Current stock only. New Haven Power Equipment is not responsible for typographical errors. © 2001-2015 New Haven Power Equipment. All Rights Reserved.